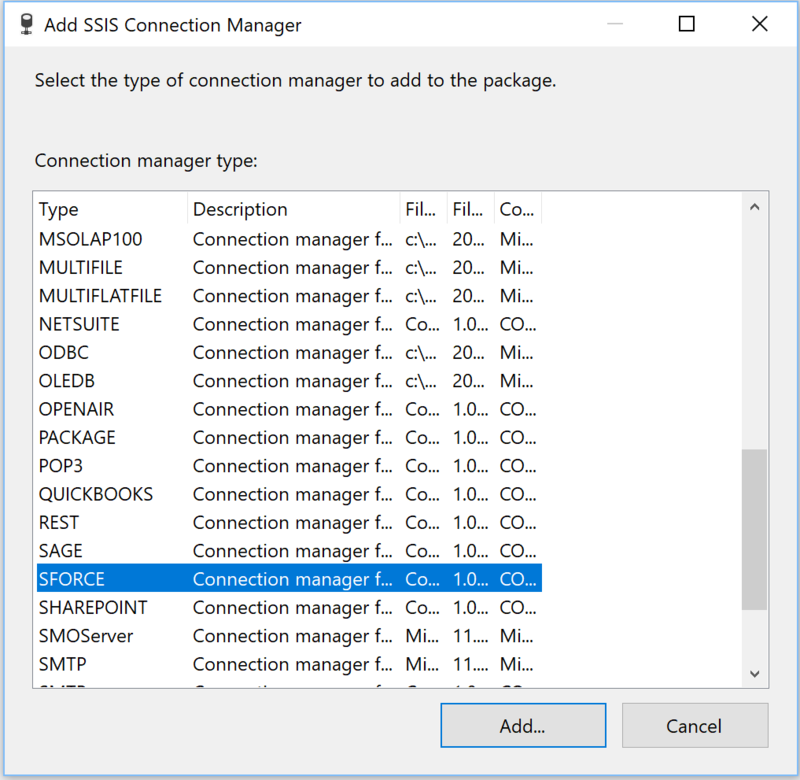 Salesforce Connection Manager is SSIS Connection Manager for establishing Salesforce connections. Use the API to build components based on Salesforce Connection Manager. In this section we will show you how to set up a Salesforce Connection Manager to access your Salesforce service. Right-click on the Connection Manager canvas. When the list of connection managers appears, expand the Type column, if necessary, so you can see the complete names of the connection managers. Scroll down the list to find the SFORCE connection manager and select it. Once the connection manager dialog opens, enter your User name, which is an email address associated with your Salesforce account. Enter your Password, which is your Salesforce password with your security token appended after it (no spaces). When you see Test Connection succeeded, click OK.
Click OK to close the connection manager dialog. Congratulations! You have successfully configured a Salesforce connection manager. Use the Server page of the Salesforce Connection Manager dialog to specify properties for connecting to Salesforce service. Specify user name in email-like format. Specify password to access Salesforce service. Specify the number of seconds before timing out session connect. The default value of this property is 60 seconds. 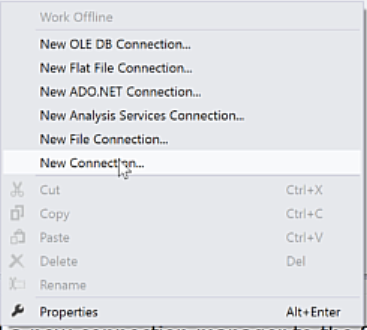 This parameter is not visible in the connection manager dialog. Use the Advanced page of the Salesforce Connection Manager dialog to to specify additional properties for your connection to the Salesforce service. Specify the ID of the organization against which you will authenticate Self-Service users. Specify the ID of the portal for this organization. Specify to allow duplicates to be preserved. For further information please check here. Specify to allow field truncation. For further information please check here. Specify to roll back all changes unless all records are processed successfully. For further information please check here. Specify the Salesforce identifier of the assignment rule to be invoked when lead or case is created. For further information please check here. Use the Proxy page of the Salesforce Connection Manager dialog to specify properties if your server is behind firewall. Where can I find the documentation for the Salesforce Connection? What is the format for entering the password and security token in a Salesforce Connection Manager? I get the following error when trying to connect: "UNSUPPORTED_CLIENT: TLS 1.0 has been disabled in this organization. Please use TLS 1.1 or higher when connecting to Salesforce using https"
How to trace the web services calls in use? If I retrieve data using one Salesforce Connection, the package execution succeeds. However if I try to use 3 or more simultaneous Salesforce connections, I get error: "The operation has timed out"
New: Updated web service proxy to version 42. New: Updated web service proxy to version 41. New: Updated web service proxy to version 37. New: Updated web service proxy to version 36. New: Enabled support for TLS 1.1 and 1.2 protocols. New: Updated web service proxy to version 30. New: A new parameter OrganizationId. New: A new parameter PortalId. New: Updated web service proxy to version 26. New: Updated web service proxy to version 23. New: Updated web service proxy to version 19. New: Included support for proxy server. New: A new parameter ServerUrl to specify service URL. This is useful for sandbox testing (Thank you, Frank).